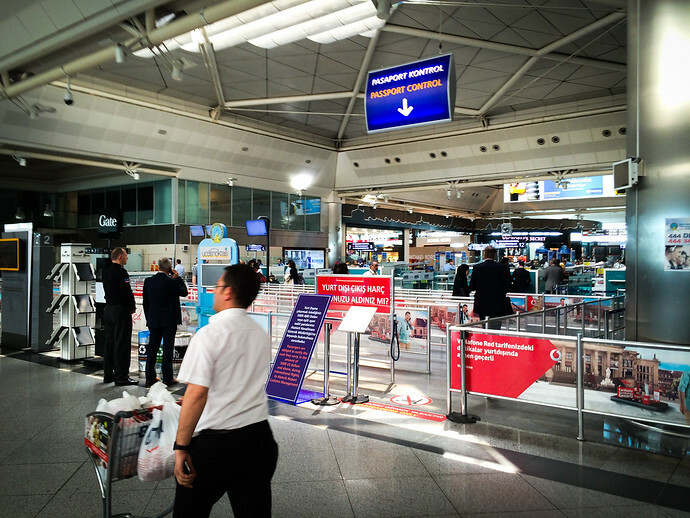 Istanbul’s Ataturk Airport is one of the world’s busiest (13th internationally) with over 56 million passengers traveling through in 2014. With so many people, long lines aren’t uncommon but this little tip can get you around big delays and on to your gate much faster than everyone else. When you arrive in the departures area, immediately to the left of the large flight status display hanging on the wall is passport control, then airport security. Almost everyone goes through here and lines are 10-20 minutes or longer at peak hours. Instead, skip this passport control and keep walking left, passin Nero Cafe on your right, following the restroom sign. You’ll notice not too much further down is another, nearly deserted, passport control and security check. This alternate entrance is there to accommodate nearby check-in counters for Al Algerie and other lesser traveled African airlines. What this means is there’s is almost never a line at this passport control and you’ll get through it plus security on average in 3-5 minutes. Afterwards you can use this password hack to enjoy free wireless near the Turkish Airlines lounge and look out for these famous landmarks on takeoff.